Lindberg’s work in drawing and sculpture taps a non-verbal physiological landscape of body and space, provoking emotional, visceral and perceptual responses to uncover an alchemy that exists in everyday life. This talk hosted by Parsons' School of Constructed Environments is held in conjunction with In Conversation: Anne Lindberg, James Dodd, and Peter Matthiessen Wheelwright on Thursday, January 31 at 6:30 pm at the Museum of Arts and Design. 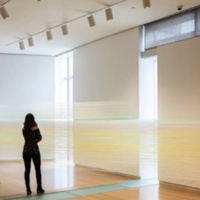 This discussion will touch on topics of perception, time, and materiality through Lindberg’s installation the eye’s level, at the Museum of Arts and Design through March 3, 2019. Hosted by the School of Constructed Environments at Parsons School of Design.